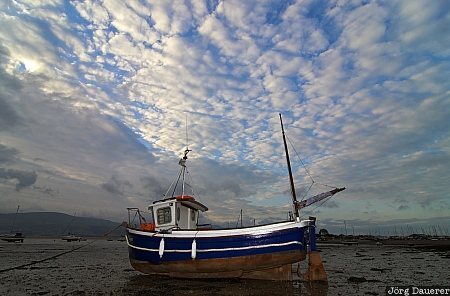 A fishing boat in the harbor of Beaumaris at low tide in front of a cloudy sky partially illuminated by a flash gun (used as a fill flash). Beaumaris is on the north coast of Wales, United Kingdom. This photo was taken in the morning of a cloudy day in September of 2007. This photo is part of the exhibition Fishing Boats (October 2009). This photo was taken with a digital camera.